Since President Barack Obama’s announcement that relations between Cuba and America are reopening, many have wondered what Cuba is like today. Beach Haven residents Deborah Whitcraft and Gretchen Coyle can tell them. The friends and authors of the book “Inferno at Sea: Stories of Death and Survival Aboard the Morro Castle,” published in 2012, have recently returned from Cuba. Special permission was required for their first trip, four years ago. Whitcraft is founder and president of the New Jersey Maritime Museum in Beach Haven. Her husband, Jim Vogel, is the museum’s executive director. Coyle and her husband John own the Sink R Swim shops on Long Beach Island. Along with being a maritime historian and author, she is a frequent volunteer at the museum. “The first trip we made to Cuba was to do research on passengers and crew members who were aboard the Morro Castle when she caught fire,” Coyle said. At that time, the two spoke with survivors Marjorie Giannini and Jerry Edgerton, and with the families of a broad spectrum of survivors, victims, and rescuers. The story of the Morro Castle is fascinating to all who love stories of the perils of great ships. But it is especially of interest to New Jerseyans. On Sept. 8, 1934, en route from Havana to New York, the ship caught fire and burned, killing 137 passengers and crew members. The ship eventually beached near Asbury Park. There have been several books about the Morro Castle and the mystery surrounding the fire, but “Inferno At Sea” has received great acclaim, since it does not merely chronologically tell the story of the disaster itself, but goes into details of those aboard her, including many of the Cubans, who, like the working class Irish in steerage on the Titanic, had far less chance to escape death than the privileged. The book has not only been popular in America. 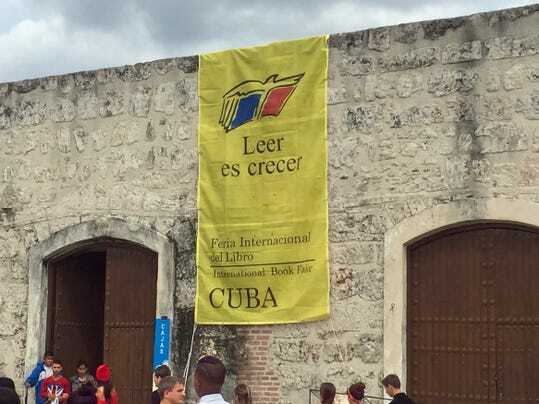 It was so celebrated in Cuba that Coyle and Whitcraft were invited back to be honored, sign books and make a presentation at Havana International Book Fair’s main venue, at La Cabana, a former prison and fortress that dates back to 1600. They said it is about a 20 minutes from Havana by car and that there is a tunnel under Havana Harbor that looks exactly like the Holland or Lincoln tunnels, probably built by the same company in the 1930s. “Thanks to Cuba’s Official Historian Ciro Bianchi Ros, and our good friend, lawyer Roberto Giraudy, we spent time at Cuba’s National Library,” said Coyle. “While checking newspapers around the time of the Morro Castle fire, we discovered a picture of a Cuban couple who were married in Atlantic City in the water off Steel Pier and the Boardwalk. We have all seen pictures of AC’s heady, crazy days, and here was one in Diario de la Marina newspaper!” she said. “To read is to learn” is the motto of the Havana International Book Fair. This was the 24th year for the event, a popular reading festival for Cubans and tourists from all over the world. There were writers and publishers from many countries. Coyle said Whitcraft was the expert in figuring out the money, while she, who lives in south Florida in the winter, has picked up enough Spanish words and phrases to do the communicating. On their way to the fair, they reached a high point overlooking small villages. “Our Cuban friends in their Chinese car, a Geely, expressed surprise that the government had not made this into a tourist outlook. We literally bumped up the side of a small mountain on an unpaved road with cows in the middle of the way and grasses touching the car,” Coyle said. They mentioned an exhibition in the Plaza de la San Francisco called “Buddy Bears: the Art of Tolerance.” There is a bear for each country. Thousands flock to it each day. Nor surprisingly, the Cuban and US bears were the most popular. They added that Chinese have been in Havana since the 1650s and there is a “Chinatown” in Havena, which thrives today with stores and restaurants. Every tour guide takes his group through Chinatown,” Coyle said. Among the other sites they visited were the old and older of Havana Vieja (Old Havana), including a Russian Orthodox Church, a gift of the Russian people given to the Cuban people during the time of Cuba’s Russian Period. They said it was open the first time they visited and they could go inside but not take photographs. Now it is closed. One of the sites they drove by was the former U.S. Embassy. “It has been the US Interests Building since 1960 with a number of Americans still working there. It could easily be reverted to our embassy again.” Coyle said. “There is a lot black wrought iron fence around it with Cubans guarding it. The Cuban and American govt. may be at odds in so many ways, such as the US Embargo, but Cubans and Americans have been living and working together for years. “There is a story Cubans tell of this building – the Bush administration put anti-Cuban/anti-Communist posters in the windows. In retaliation, you see a few flagpoles in the right of this photo. There are many of them from the Malecon side, and the Cuban government puts up flags galore up, blotting out all the signs. In ways both our govts. act like children at times,” she added. “It’s very sad,” said Coyle. Government housing is falling apart, there’s a lot of homelessness and unemployment. “The government pays attention to arts and education,” Coyle continued. “Cuba has the highest literacy rate in the world – yet the buildings are falling apart. There is a lot of unemployment and homeless people. There are still a lack of supplies for the average family in the way of food, water, and electricity. Yet upscale restaurants are thriving. The only ones starting to come up are the young people and those in the service industry, restaurants and tour guides. bus drivers, anyone who makes tips in Cuban pesos. The Cuban govt. pays its professionals – lawyers, doctors, dentists, teaches, etc in government pesos, which are worth 1/20 of the Cuban peso which is used by tourists. Consequently, these well educated people are making a fraction of what the young folk in the service industry are making. Both Coyle and Whitcraft said they look forward to going back again some day. “We have made many good friends over there, and we keep in touch on Facebook and Twitter, although sometimes Cuban Internet is not so good. In the meantime, the two have a new book coming out this summer. “Deb and I have an Arcadia Publications Pictorial Book of Tucker’s Island coming out in August. It will contain photos never before seen of Tucker’s Island from a number of sources, including the Tuckerton Historical Society, and families who lived on the island. It will be the first book ever devoted strictly to Tucker’s Island. After this book is out we will decide whether to write a sequel to Inferno at Sea,” Coyle said.